Zone plate test chart. The highest frequency ring in the large circles is such that a white ring exactly resolves to 1 pixel when the middle gray background covers a 16:9 1920x1080 resolution (or when the light gray background covers a 3:2 1920x1280 resolution). Ideal to test video subsampling artifacts. The smaller circles have 2x (medium) or 4x the resolution and can measure up to 39 MPixel resolution sensors. Use the original version as all resampled SmugMug sizes already suffer badly from Moiré. Even the original version has been resampled, although carefully (e.g., applying Gaussian blur). This was necessary to stay within SmugMugs constraints. But resampling a zone plate chart is an art. Also, it is only usable up to 3x rather than 4x rings. Contact me of you need a higher res version or a fully Moiré-free version. Printing this image on anything smaller than A2 paper is a great test of a printers capabilities too. An Epson 3800 can print out this resampled test chart producing very mild Moiré only. 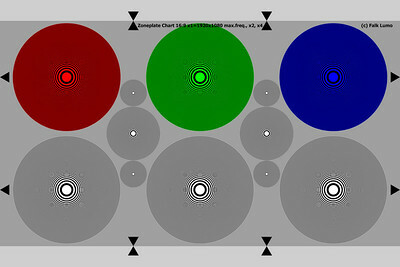 The red, green and blue circle can be used to better study color Moiré artifacts. (c) Falk Lumo. The test chart may be used in testing, both commercial and amateur, provided the copyright notice is kept visible.